Big Big Train have made the surprise announcement that they’ll release a brand new album later this week. They launched their 10th record Grimspound at the end of April this year to great critical acclaim – and they’ve wasted no time in setting up its follow-up, The Second Brightest Star, which is out this Friday – June 23. In addition, the record will come with a bonus selection of 30 minutes of music where songs from Folklore and Grimspound are presented in extended format. Bassist Greg Spawton exclusively tells Prog: “The Second Brightest Star is the last album in a cycle of releases which started back in 2009 with The Underfall Yard album. “Our writing over this period has focused on the English landscape, the people that work on the land and their folklore stories. 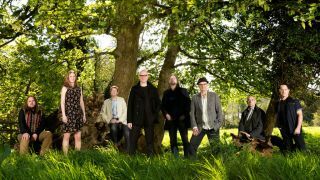 To mark the surprise announcement, Big Big Train have released a stream of the new album’s title track which can be found below, along with The Second Brightest Star’s cover art and tracklist. The album is available to order from Burning Shed and The Merch Desk. It’s available in limited edition double gatefold 180g seafoam green vinyl, CD and on hi-resolution 24⁄96 download. All vinyl copies will include a code for a complimentary hi-res download. The Second Brightest Star will be released on Spotify and other download and streaming services at a later date in July. Big Big Train: "We're proud to be defined as a prog rock band"